Today we shall discuss a few simple multiple choice practice questions on wave motion including sound. Often your knowledge and understanding of basic principles will be tested in the AP Physics Examination and the questions I give below are meant for this. Which of the above waves can propagate through vacuum? Infra red waves microwaves and light waves are electromagnetic waves and hence they do not require any medium for their propagation. Sound waves are mechanical waves which require a material medium for their propagation. The correct option is (b). n1 = nv/(v – vS) where n is the actual frequency of the source, v is the speed of sound and vS is the speed of the source. Therefore, when a sound source moves past a listener, the pitch of the sound decreases suddenly [Option (e)]. [You may click here to see a useful post in which the equations to be noted in this section are given]. (3) A fighter plane moves away from a radar installation at a speed equal to twice the speed of sound. If the real frequency of the sound emitted by the fighter plane is n, what is the apparent frequency of the sound of the plane as heard by an observer at the radar installation? n’ = nv/(v+vS) ) where n is the actual frequency of the source, v is the speed of sound and vS is the speed of the source. n’ = n/3, as given in option (c). (4) Tuning fork A has a small piece of wax attached to one of its prongs (Fig.). When this fork and another fork B of frequency 286 Hz are excited together, 3 beats per second are produced. The wax on the fork A is now removed and the two forks are again excited together. The number of beats per second is found to be 3 itself. What is the frequency of fork A when the wax on it is removed? The beat frequency is the difference between the frequencies of the forks. Since the fork A without wax produces 3 beasts per second with the fork B of frequency 286 Hz, the frequency of fork A must be either 289 Hz or 283 Hz. If the frequency of A is 283 Hz, its frequency when loaded with wax will be less than 283 Hz and it will produce more than 3 beats per second when excited together with for B. Therefore, the frequency of fork A must be 289 Hz [Option (b)]. When the fork A is loaded with wax, its frequency gets reduced from 389 Hz to 383 Hz and it produces 3 beats per second when excited together with fork B of frequency 286 Hz. 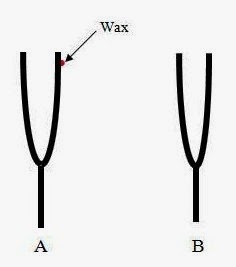 When the wax on the fork A is removed, its frequency becomes its original frequency 289 Hz and once again it produces 3 beats per second when excited along with fork B of frequency 286 Hz]. The amplitude A will be infinite when b = c and d = 0. Therefore the condition for resonance is given in option (d).